If you want to catch the fish for the dinner yourself, you can try it under the guidance of a local fisherman. Take a typical fishing boat on the sea and learn how to catch with fishing line and hook kingfish, tuna and barracuda. If you are interested, we can organize such a tour for you. Behind the sandbank in front of our hotel you find a perfect location to catch octopus. Our fisherman Moses likes to go out with you to show where the Octopus is hiding and how to catch it. This is a relatively new sport, becoming increasingly popular. 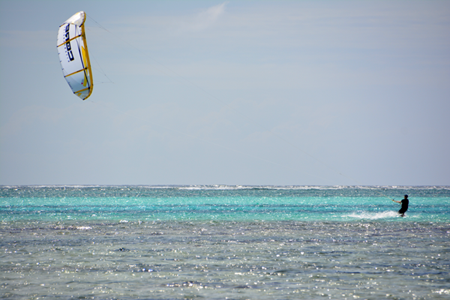 Michamwi's beach is excellently suited for kiting because it is rarely frequented. In Paje, around 10 minutes by car are several kite centers. Beginners and advanced courses are offered there as well as the rental of the entire equipment. Appointments can be arranged by us. STAND UP PADDLE , a new board sport, easy to learn. Discover the mangroves, one of the most beautiful, unknown and highly endangered environments on our planet which is only accessible by SUP or enjoy the sunset whilst working out. The warm, turquoise waters of the Indian Ocean is home to about 2,000 species of fish. Almost the entire east coast of Zanzibar is preceded by a still largely intact coral reef, ideal conditions for getting to know the fantastic underwater world of the island. 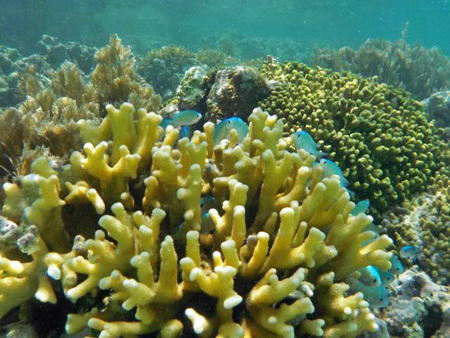 Particularly beautiful corals are found in front of the small private island of Mnemba. Behind the sandbank in front of our hotel you find a small, but beautiful snorkeling area. Snorkeling and diving excursions can be arranged by us; PADI Diving is offered from an adjacent diving school.